Honestly, this summer berry, lemon, and mascarpone tart will become your favorite dessert of the season as it is so simple to make. The pastry case is the trickiest part, but just follow the instructions, and all will be fine. If making the sweet pastry case is too much for you, feel free to use a store-bought one. We promise, we won't tell! The filling is no-cook, so it takes but a few moments to make. 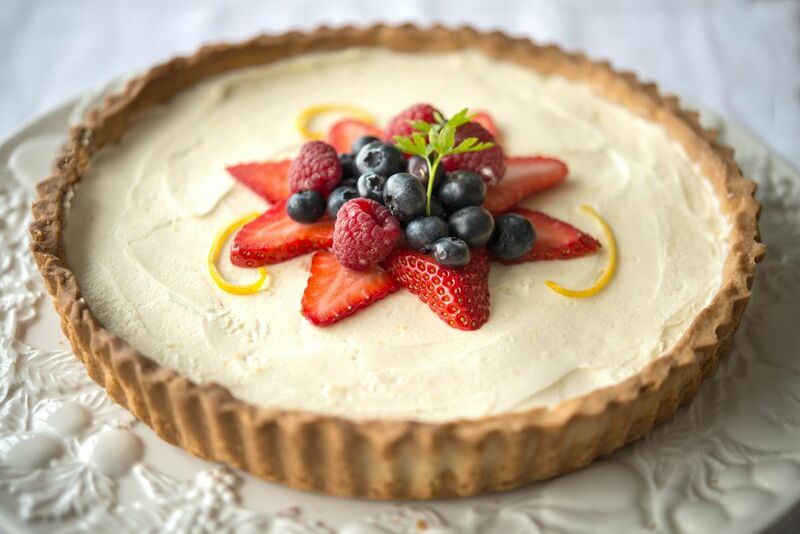 Just top the rich, creamy tart with your favorite berries arranged in any pleasing way and serve. It is that simple. Place the flour, salt, butter, and 1/2 cup of the powdered sugar into the bowl of a food processor. Process until all the ingredients are mixed and resemble coarse sand. Add two tablespoons of cold water and process again, adding a little more water as needed for the pastry dough to clump together. Tip the contents of the food processor onto the countertop and lightly need the pastry dough together and leave to rest for 10 minutes, then roll between two sheets of parchment paper into a circle large enough to line an 8-inch loose-bottom tart tin. Place the pastry still in the paper into the refrigerator for 20 minutes to chill. Lightly grease the tart tin. Carefully remove the top layer of parchment paper from the pastry and flip over to cover the tart tin and remove the second sheet of parchment. The pastry is quite fragile, but working quickly, gently press into tin covering the bottom and the sides. If the pastry cracks – and it is likely it will – just gently push it back together. Trim the edges and crimp using your thumbs and forefingers. Place one piece of the parchment paper into the tart and cover with either baking beans or uncooked rice grains to weigh the paper down -- this is called blind baking. Cook in the center of the hot oven for 15 minutes. If the top edges of the tart brown too quickly, cover with aluminum foil. Remove the parchment and beans or rice and cook for 5 more minutes. Once the pastry is a deep golden brown, remove from the oven and leave to cool completely. Using an electric hand-mixer, beat together the vanilla extract, Mascarpone cheese, heavy cream, remaining 1/2 cup of powdered sugar, lemon juice, and zest, until the mixture thickens and creates soft peaks. Fill the cooled pastry case with the thick cream and smooth with the back of a spoon or a small spatula. Decorate with the summer berries. Keep chilled in the refrigerator until needed. You can make the tart on the day you need it in the morning, but do not decorate until ready to serve.